I love making a roasted chicken, and I always try to change it up and do something different with it when I roast one. This version is one I make when I’m pressed for time because it’s basically just a one pot meal. A few years back I saw Paula Deen on Food Network where she took a trip to France. Part of the episode showed her walking through the outdoor food markets where she visited a stand that was making rotisserie chickens. They had these racks of chickens spinning on the rotisserie and underneath the chickens, layered evenly on the bottom of the rotisserie, were potatoes. The potatoes cooked in the drippings from the chickens spinning above them. How good did that sound? Since I don’t have a commercial size rotisserie, this was the closest I could come to recreating what looked like a mouth-watering dish. This chicken I roasted was over 7 pounds and it was the smallest roaster I could find at the store that day. I normally like a 3 to 4 pound chicken, but I didn’t have that choice. It also took longer than I expected to cook so dinner was a little late to the table on a night when I didn’t really have that much time to spare. But, that being said, it was a very juicy chicken and ended up being worth the extra roasting time. I’ll give you a guideline recipe to follow, but feel free to add whatever spices or vegetables you and your family prefer, along with adjusting your cooking time based on the size of your bird. The following dry spices/herbs use at your own discretion and sprinkle on top of the bird and then rubbed in before baking. 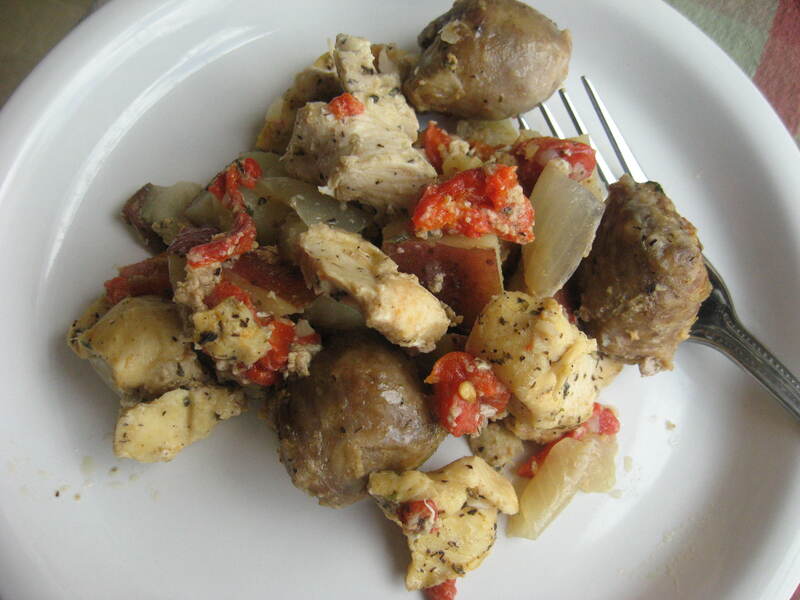 Wash out chicken, pat dry and place on a plate. Rub on the dried herbs/spices and set to the side. 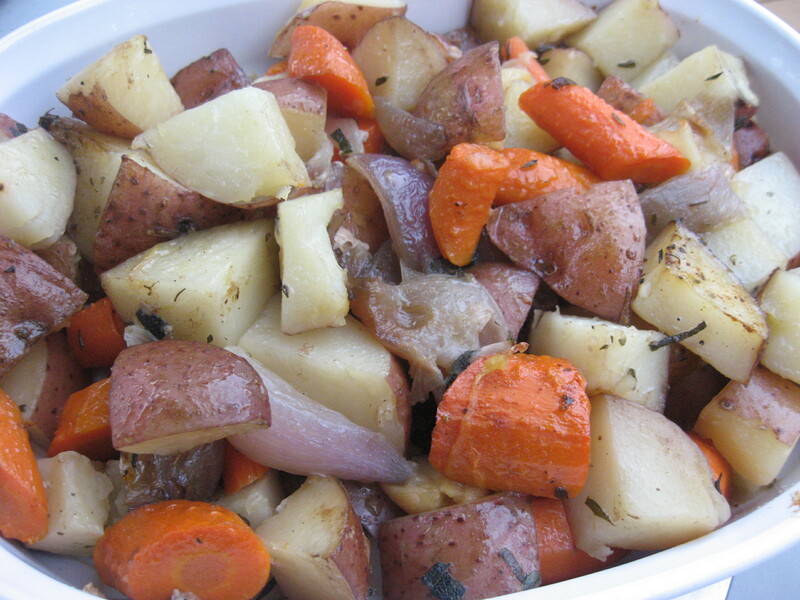 Begin cutting the potatoes, onions and carrots by quartering them. Break apart the head of garlic leaving each clove in it’s skin. Place the potatoes, onions, carrots and garlic in the bottom of a large roasting pan and season with salt and pepper to taste. Add the chopped rosemary and sage and mix together. Place the chicken on top of the vegetables and place on the middle rack of your oven. Roast until the chicken is done. 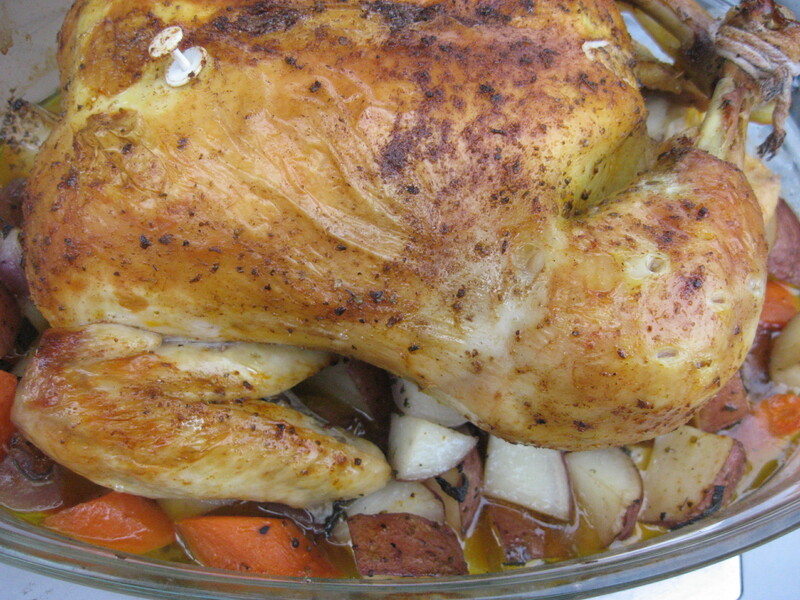 Remove from the oven, place the chicken on a cutting board and cover to keep warm. Allow the chicken to sit for a few minutes to lock in all the juices. Remove the roasted vegetables to a serving platter with a slotted spoon. Carve up your chicken and serve. Notes: Because of the huge size of the chicken I used I ended up beginning the cooking process by covering it with aluminum foil for the first hour of roasting so I wouldn’t burn the chicken or the vegetables with the increased cooking time . My chicken took a total of 2 1/2 hours to cook completely. After the first hour of cooking I removed the aluminum foil and allowed it to continue cooking until done, allowing the skin to crisp up and brown. Fall is definitely in the air, and I’m not sure how I feel about that. I’m still trying to cling to the last remnants of summer, while at the same time enjoying the cooler and crisp weather that fall brings. One thing I do love about the colder weather is comfort food. By the time the end of August is rolling around I’ve kind of had my fill of grilling food every night, which is something we spend most of the warm weather doing. I was thinking of recipes to make for something comforting for Sunday night dinner. The weather was overcast and raw out with some drizzle, so something warm and filling was on the menu. My children love Chicken Pot Pie, and I haven’t made it in a while. I have a quick recipe for one that I normally throw together when I do make it but it’s not fantastic. Good, but not great. I remembered visiting one of my favorite bloggers sites awhile back and seeing a recipe for this dish that I kept on the back burner of my brain to make one day. Today was the day. The blogger was Karen from Our Life in the Kitchen. What drew me to this recipe on Karen’s site was the rustic feel of it. This was vastly different from the version I have normally made. My version has more shortcuts and is a quick fix meal. The irony of that is Karen’s version is definitely a homemade version, and took barely longer than it did for my quick version. I’m not going to share my recipe with you because it’s just not that great. 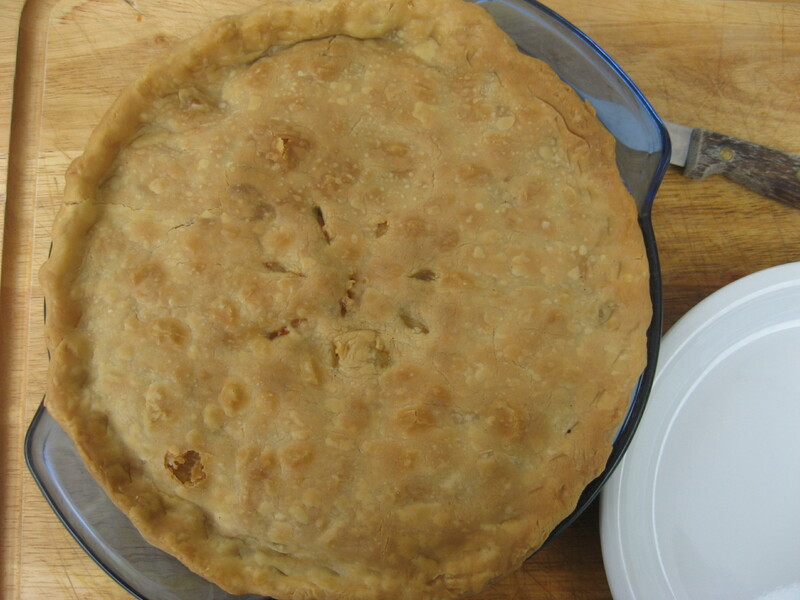 I will tell you that the only two similarities my recipe had versus this one was that each used store-bought pie crusts and each contain chicken. Period. But this version is one I will be making over and over. My family devoured it and there was nothing left. The only thing I changed was the addition of the peas. None of my kids will eat peas so I knew if I put them in I would hear complaints. As for the rest of the recipe, I followed it exactly. Try it on one of these cool and crisp fall days. You will absolutely love it. Want to know how to make it? 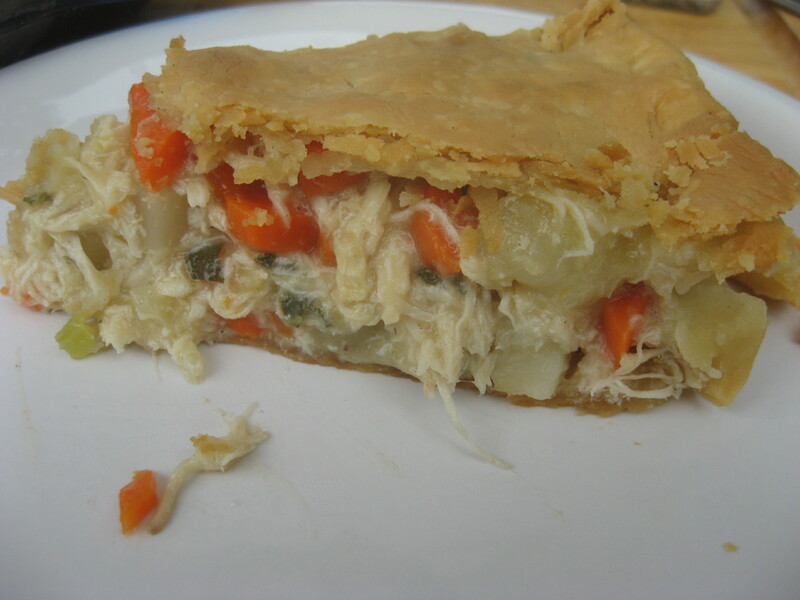 Check out Karen’s blog and her Chicken Pot Pie and she will take you step by step through the recipe with her gorgeous photos. Enjoy! A few years ago, my husband came across a recipe in a magazine and decided to make it. When he told me about it I looked at the recipe and thought, This is not something I would have chosen. Nobody is going to eat this. One of the few things my husband and I have in common is our enjoyment in cooking. Not always together since he tends to crowd me in the kitchen. But there have been plenty of times I have been adventurous with my trying of new recipes, so I wasn’t about to crush his hopes at trying something different. The original recipe, which we lost several years ago when the magazine got thrown out, was cooked in the slow cooker. It also contained pork chops. We found the pork chops, no matter if we used boneless or bone in consistently came out dry and everyone preferred the Kielbasa anyway. So from memory we made the recipe again, leaving out the pork chops, doubling up on the Kielbasa and the sauerkraut, and it became a hit. My daughter will not come near this dish. My 8-year-old son, however, loves this dish. He devours it when I make it. This is the same child who refuses to eat macaroni and cheese unless it comes out of a box. My pickier eater out of all three of my children. And this is the dish he loves. I don’t try to figure it out, I just go with it. Makes life easier. This type of dish is really something you either really like, or really don’t like. I haven’t come across any middle ground here. For us, it’s become a favorite. The smokey flavor of the kielbasa, the briny tang of the sauerkraut, and the potatoes that just absorb it all work really well together. This is really easy to make and it’s very forgiving. I don’t really worry about measurements here because no matter how we have made it, it always turns out good. Slice potatoes and Kielbasa and set to the side. In the bottom of a large dutch oven, begin layering your ingredients. Place 1/3 of sauerkraut on the bottom of the slow cooker. 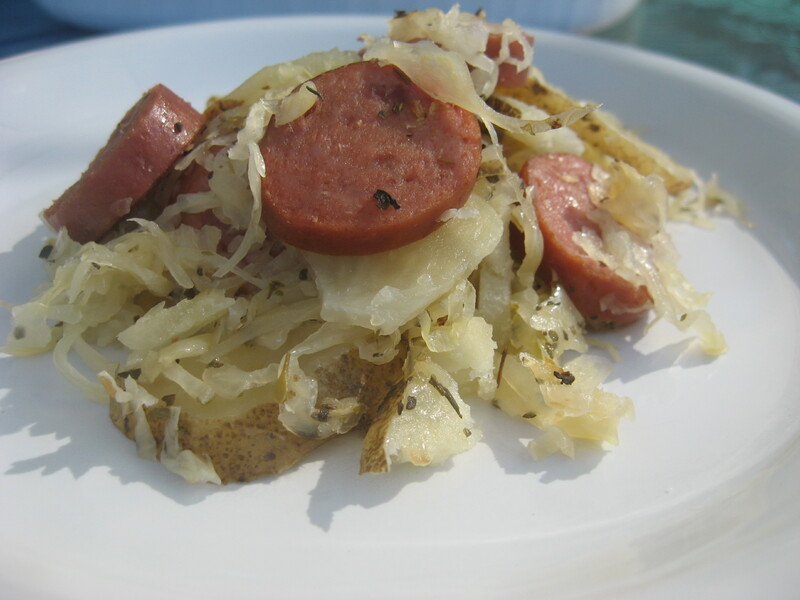 Top the sauerkraut with some sliced potatoes follow by a layer of sliced Kielbasa. Sprinkle with some black pepper and italian seasoning. Repeat the layers, ending with a layer of sauerkraut, italian seasoning and black pepper. Pour over the liquid of your choice, either the wine, beer or chicken broth. Allow to cook for an hour to an hour and fifteen minutes. Remove from oven and keep covered until ready to serve. Note: You will see I left out salt. You don’t need it. Between the sauerkraut and the Kielbasa, you will have plenty! 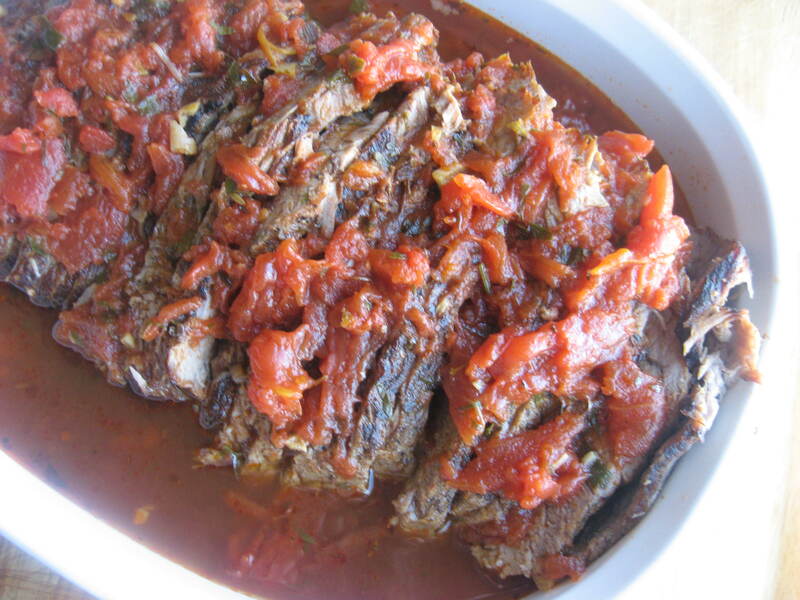 If you prefer to cook this in the slow cooker, use the same layering process, and cook on low between 6 to 8 hours. This time I used Russett Potatoes, because that’s what I had on hand, but I prefer it with Red Potatoes.